Banner is GCC’s primary information management system, and Banner Self Service (BSS) provides you with important resources and tools. You are responsible for ensuring that personal information about you—namely your permanent address, non-GCC alternate email address, and phone number—is correct and current. Why will keeping your personal information in BSS updated help YOU? If you forget your GCC password, you may use the automated reset tool to set a new password. Ensure the paper mailings sent to you are sent to the correct address. 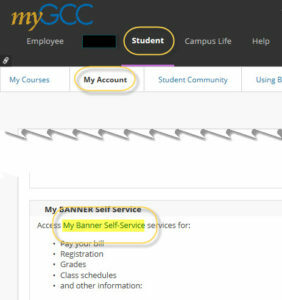 To access Banner Self-Service (BSS), log in to myGCC (GCC homepage—click myGCC link at top-center). Select the “My Account” sub tab and scroll down for “My BANNER Self Service” menu. Once in Banner Self Service, click the Personal Information tab. Click the desired link to update your information—e.g., alternate email address. 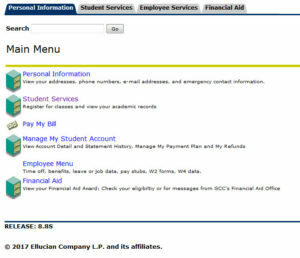 You will have an “Employee Menu” option only if you have worked for the college (through College Work Study or other programs). You can use the Banner Self Service link on that page, since it goes to the same place.